Another beastie has joined our family. This one has many good “points” but is not so easy to snuggle with. 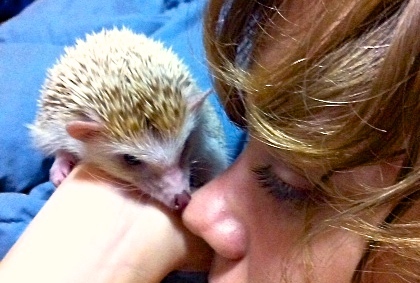 Henry the Hedgehog was a gift to my daughter on her 17th birthday and although I should have resisted, I couldn’t say “No.” I have always had a soft spot for these pokey little Erinaceidae. They do tend to be a bit prickly on the inside as well as the outside… after all, they are related to shrews, but their charms are undeniable. 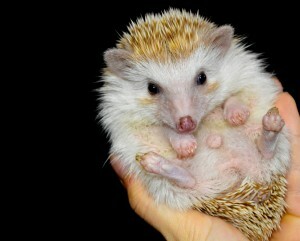 I mean, how can you resist a hedgehog? This particular little hedgehog is of the African Pygmy Hedgehog variety and must be handled gently and regularly to help it develop a congenial temperament. The little adorable is getting lots of attention, lots of sleep and lots of hedgehog food. He is a good eater and cleans his bowl every day. He has a large cage with a hidey-house, a water bottle, food bowls and lots of shredded paper in which to snuffle about. When his nose is out and he is woofeling about, that means he is relaxed and happy. 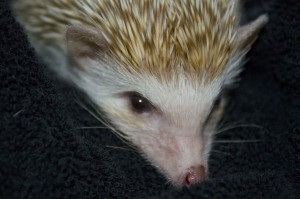 When he hisses and his quills go up (beginning with those around his face) that means he is not a happy camper. Poor little guy. He tries so hard to look intimidating, but when those forehead quills go up, he just looks adorable. Sorry, Henry, but a giant chestnut just is not that threatening… unless you step on one in the dark… which thankfully hasn’t happened yet. Next step is to get Henry to make friends with Bjorn the Golden Retriever. We’ll see how that goes. This type of hedgehog does not get very big. It sheds individual quills occasionally, but they grow back. Our dog is wary of this poky little creature and doesn’t want to get too close.